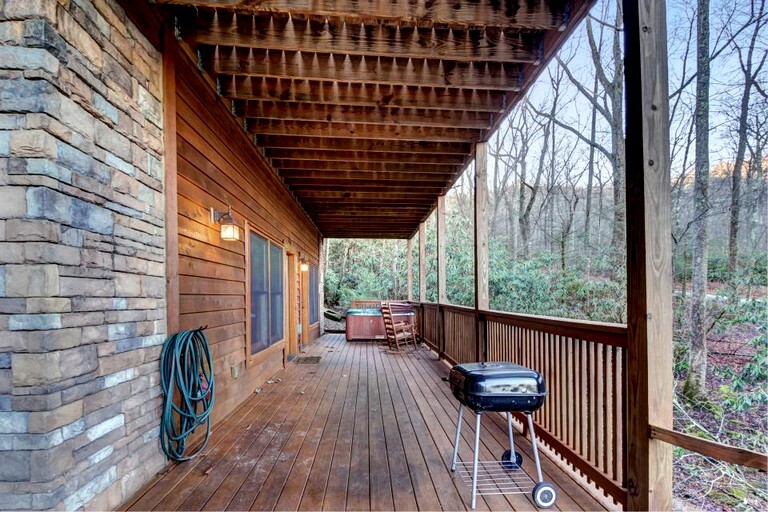 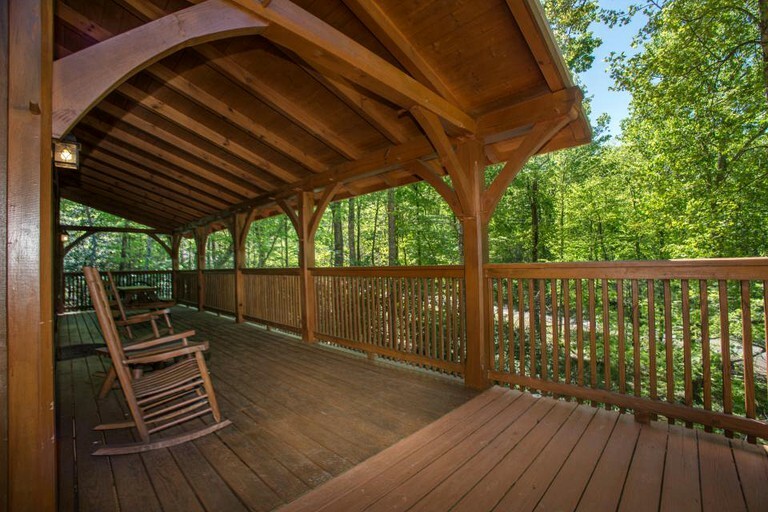 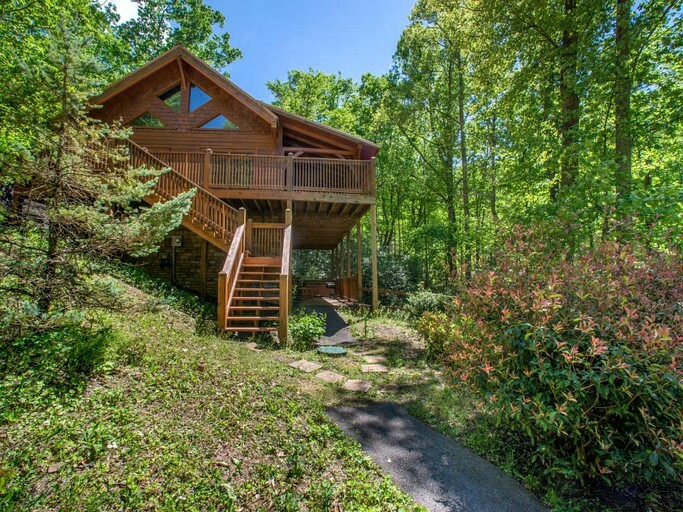 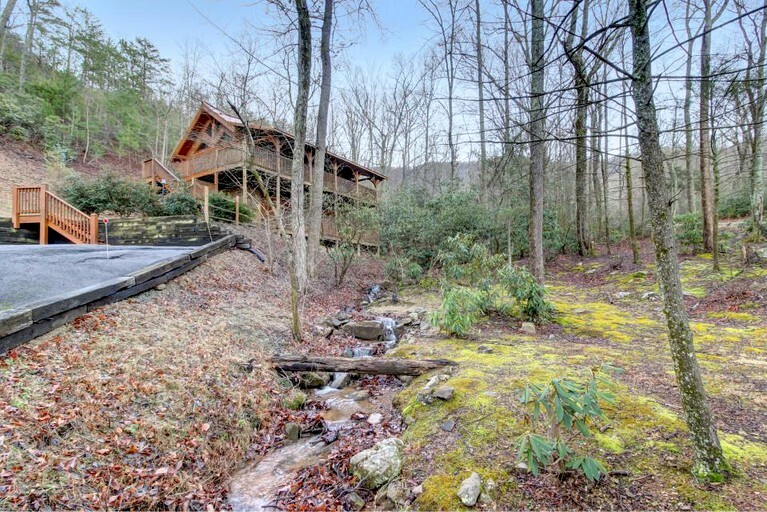 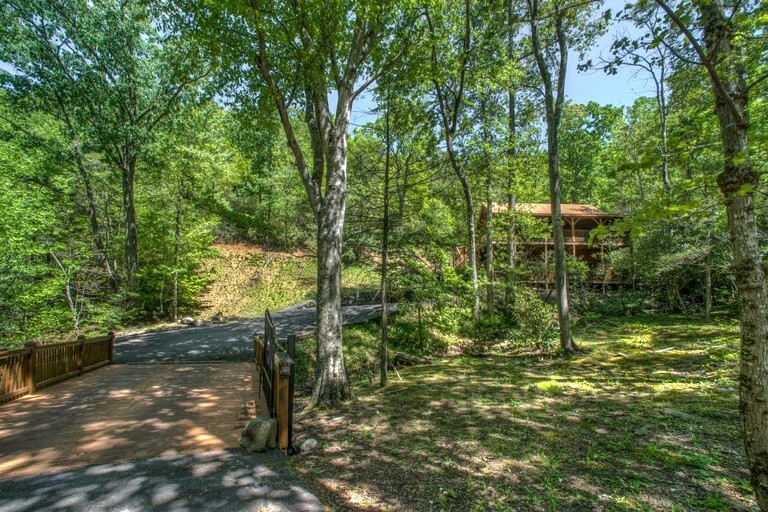 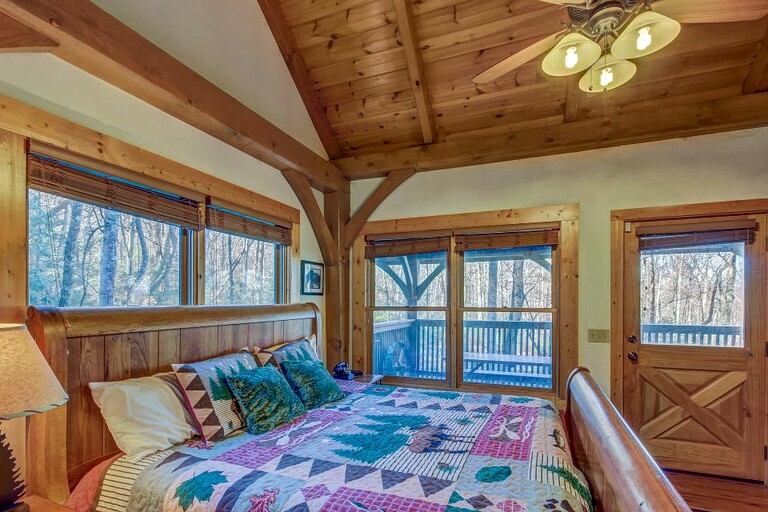 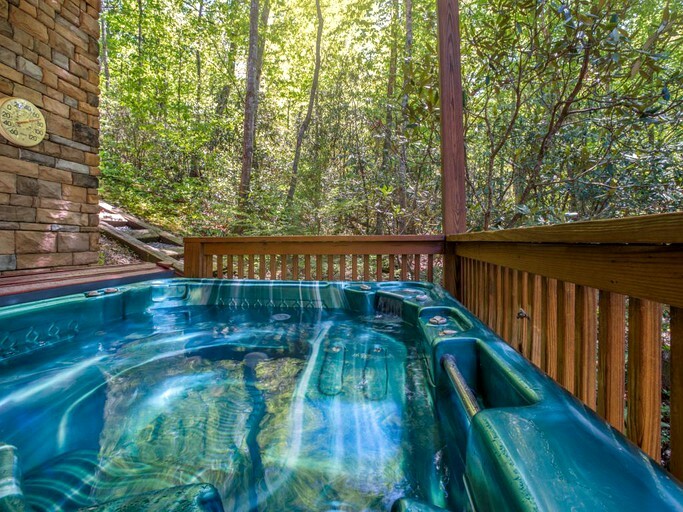 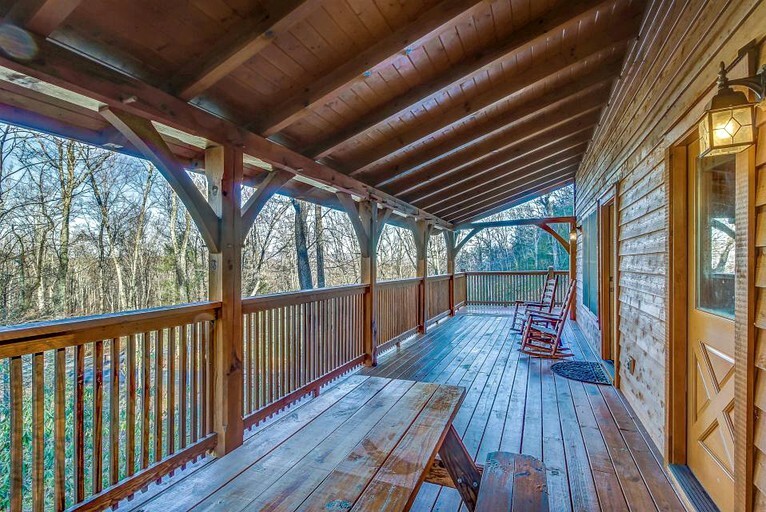 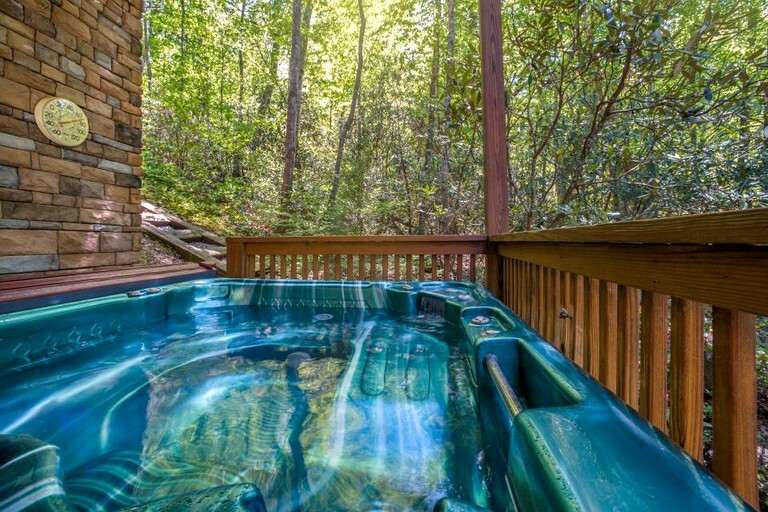 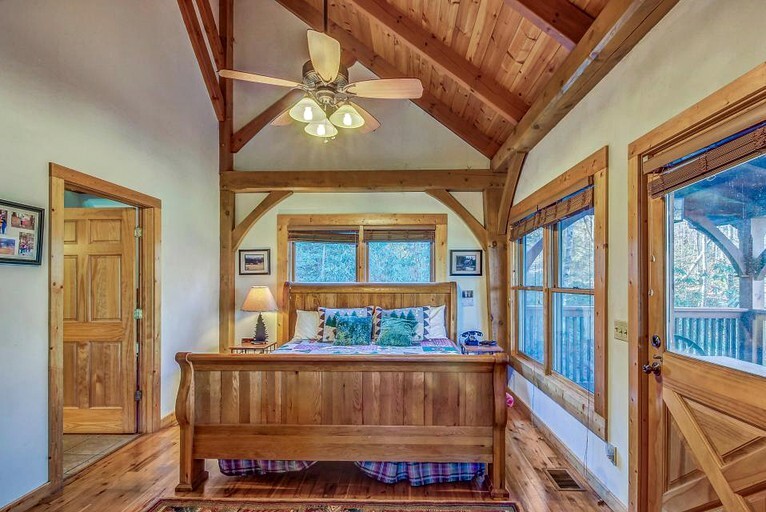 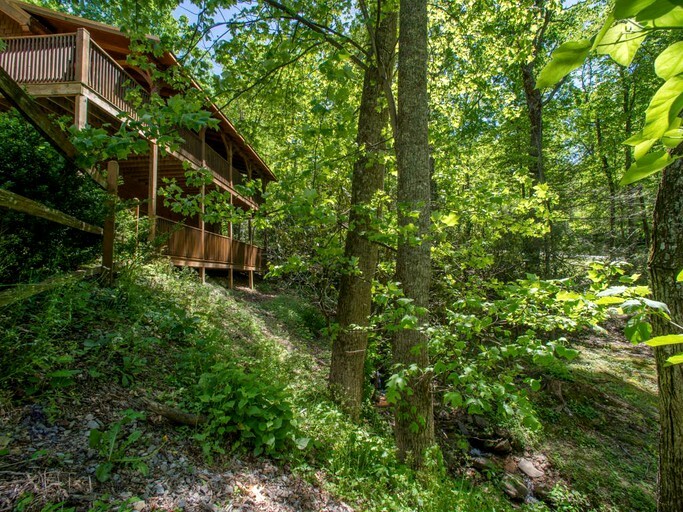 This secluded cabin in the woods seems a world apart, and yet is just minutes away from attractions like Pigeon Forge in Tennessee. 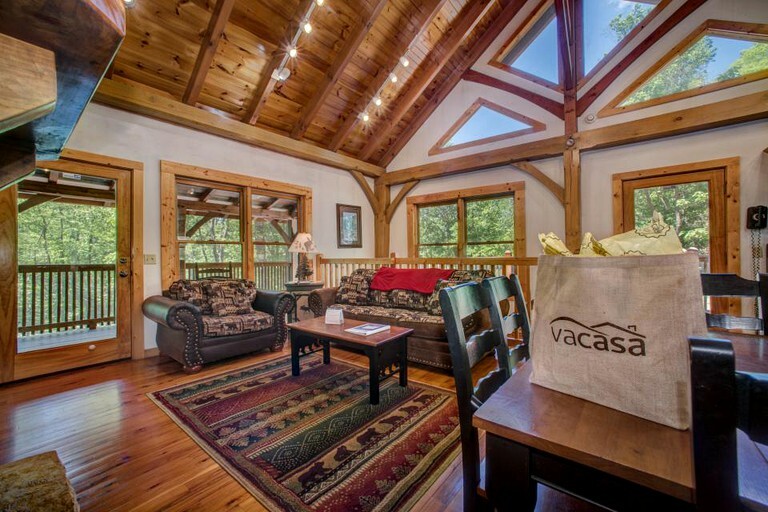 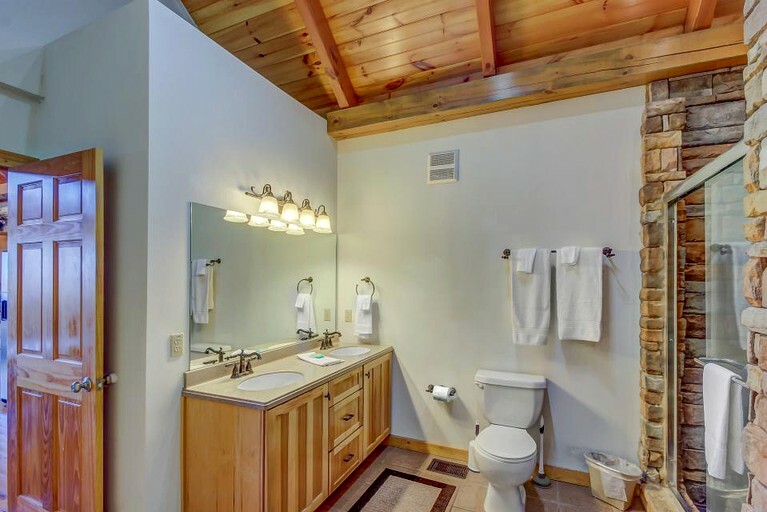 With two bedrooms and two bathrooms, this spacious cabin comfortably accommodates up to six guests. 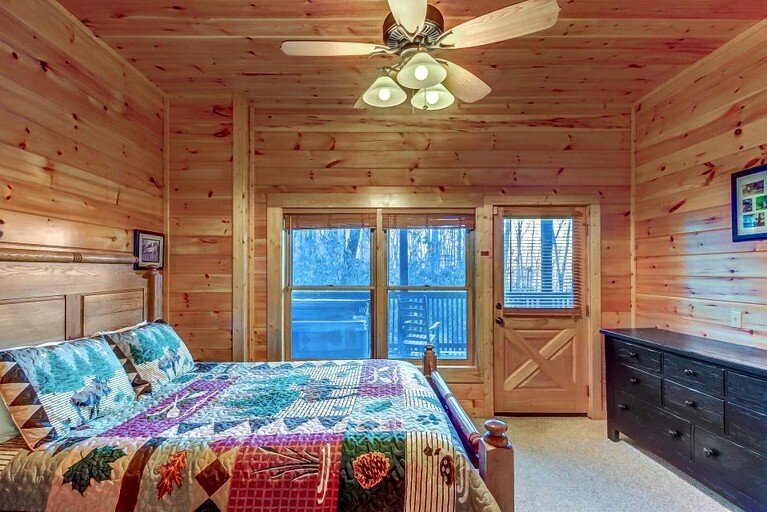 The first bedroom features a king-size bed, while the second features a queen-size bed. 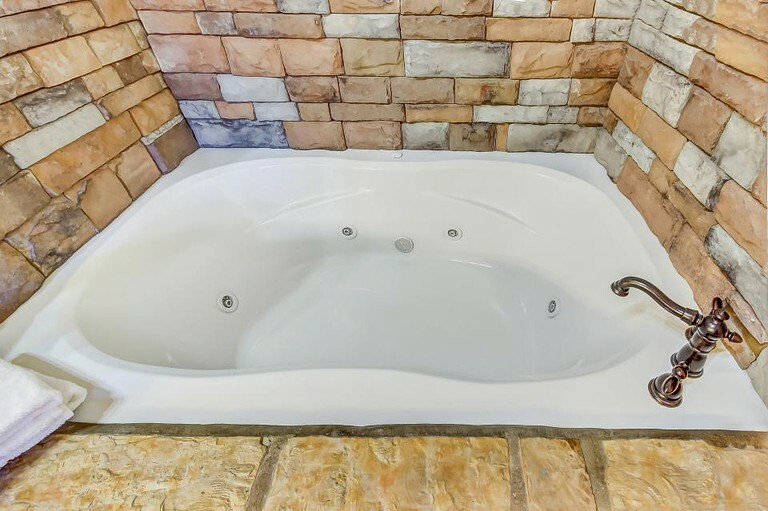 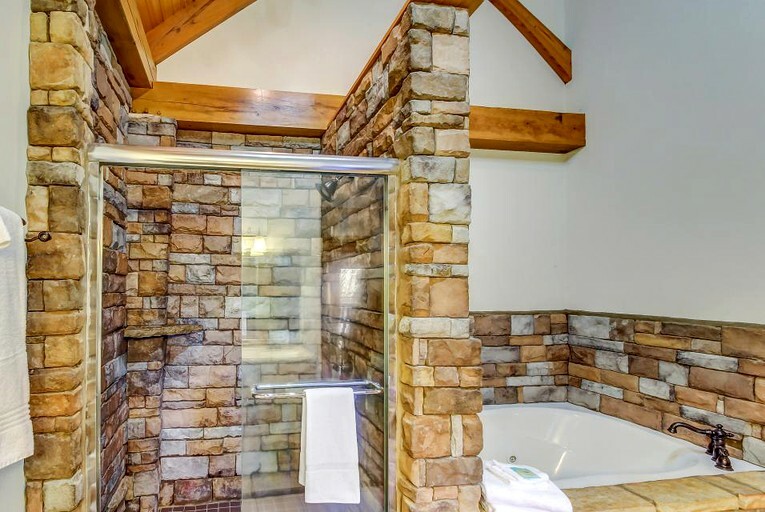 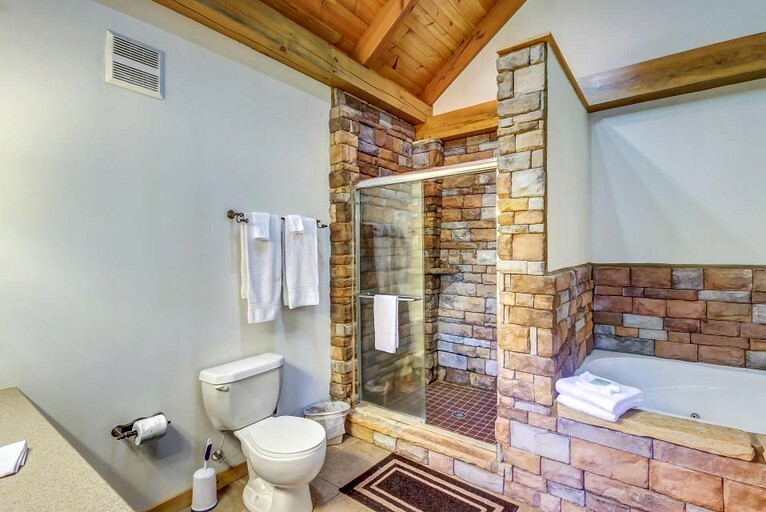 Both bedrooms have a private bathroom with a Jacuzzi tub for a relaxing soak. 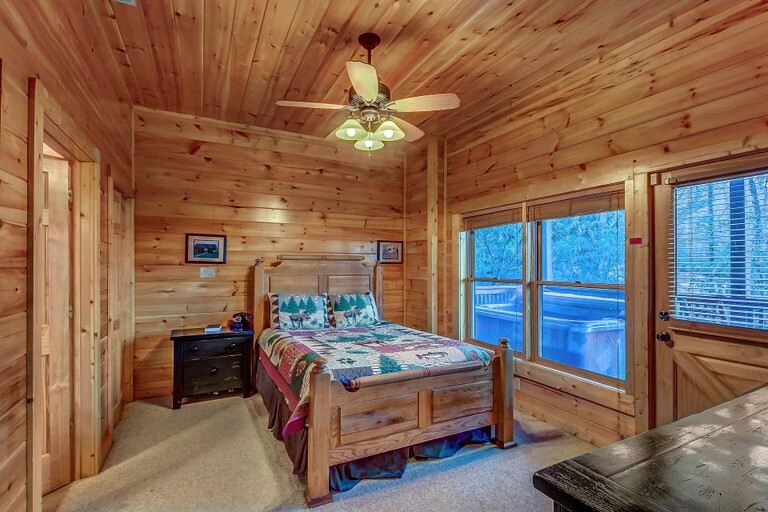 There is a sofa bed to accommodate extra guests.The cabin has central air conditioning for extra comfort. 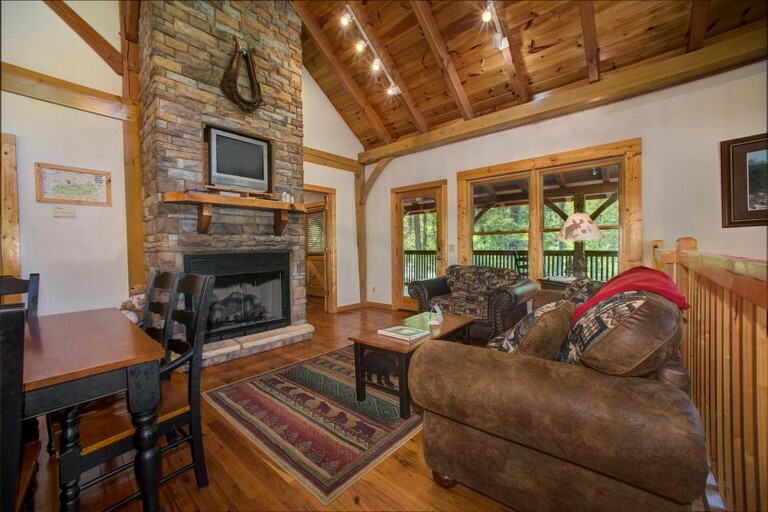 The elegant interior boasts Australian cypress wood floors that give the space a warm and luxurious vibe. 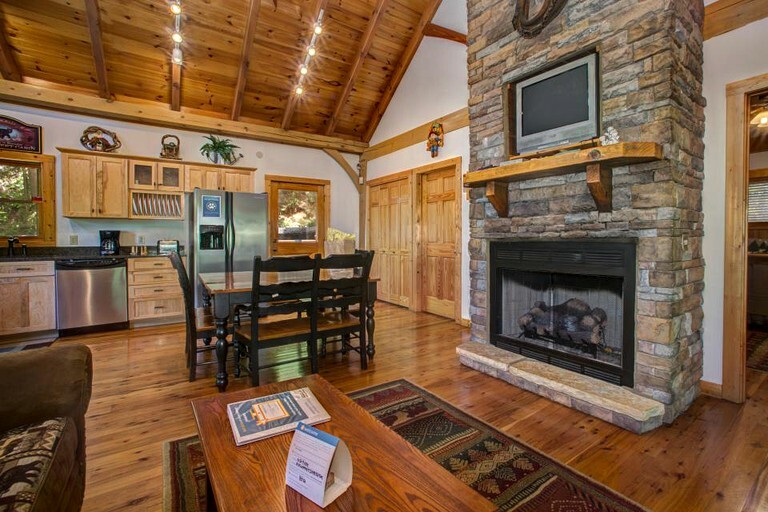 The highlight of the living room is the beautiful floor to ceiling stone hearth gas fireplace. 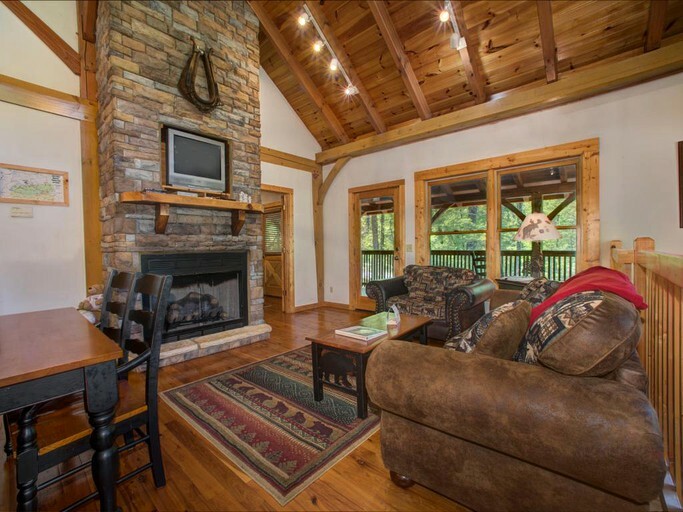 Guests can kick back on the comfortable sofa and armchair to enjoy the warmth of the fire and watch a favorite movie on the TV. 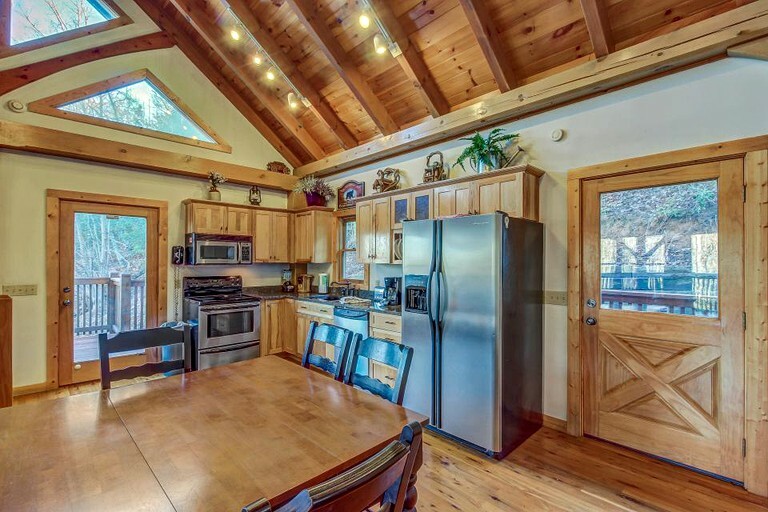 The open floor plan continues on to the fully-equipped kitchen, which features an oven, a stove, a microwave, a fridge, and a dishwasher so that guests can spend less time cleaning up and more time enjoying a lovely vacation. 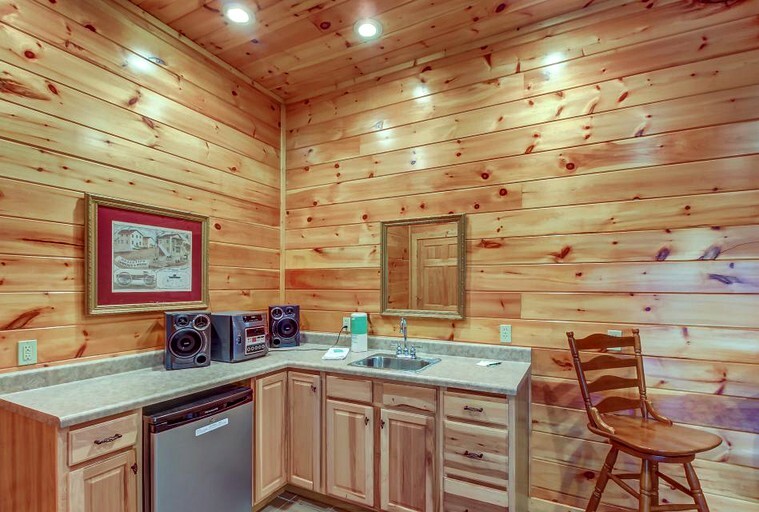 For convenience, a coffeemaker, a toaster, and a blender are also supplied. 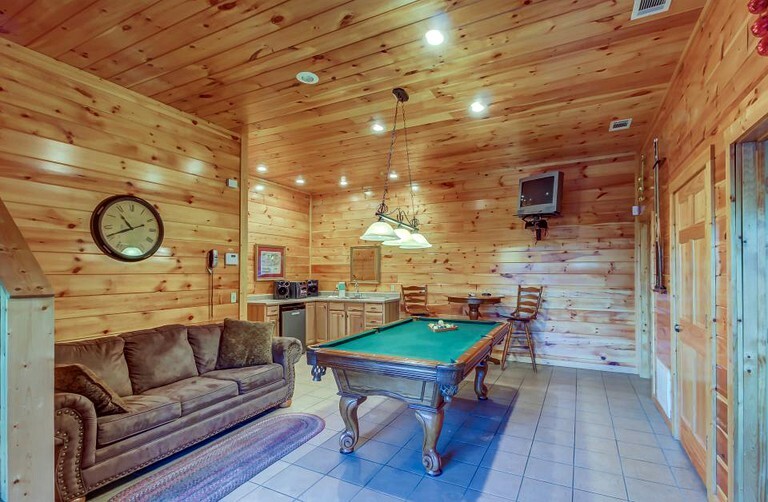 Downstairs, the game room features a pool table for some friendly competition, a mounted TV, a small table with some chairs, and a sofa bed. 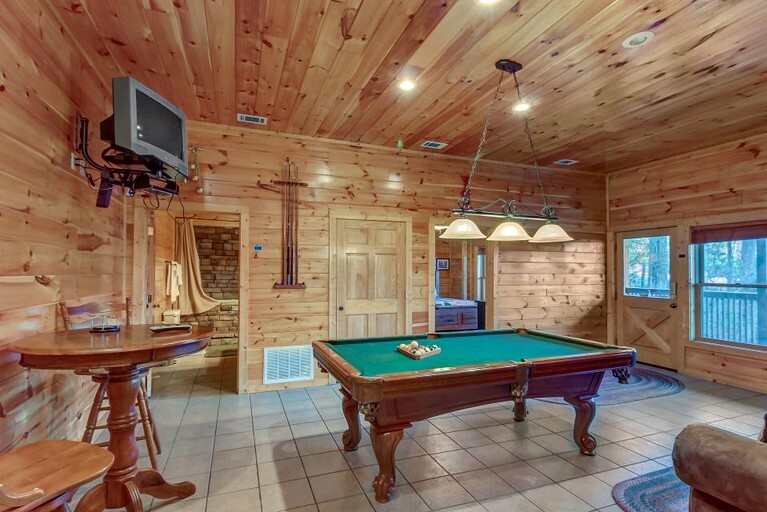 Guests can enjoy a drink at the wet bar without even having to leave the space. 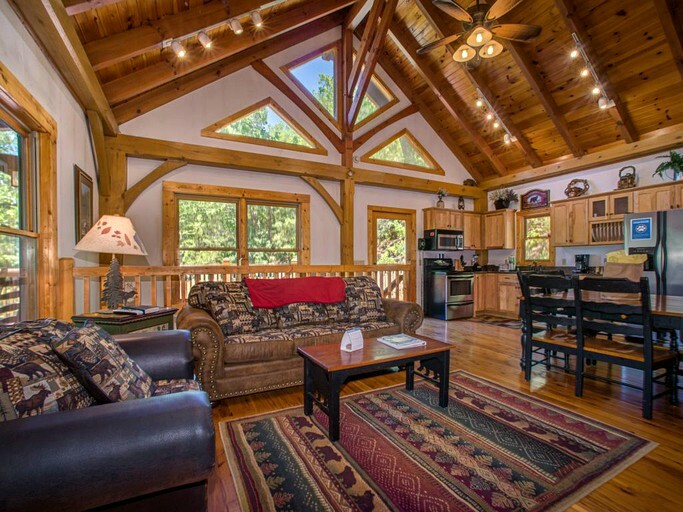 Complimentary Wi-Fi and cable TV are provided. 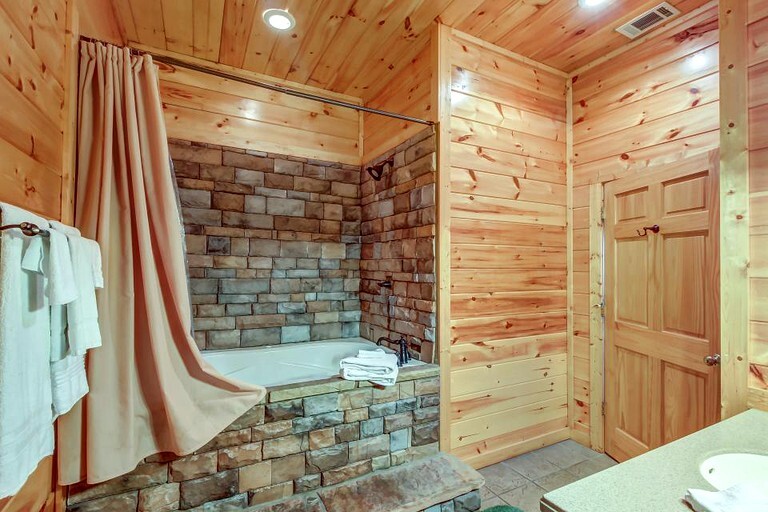 The cabin features a private hot tub on the wrap-around deck, two Jacuzzi tubs, and a gorgeous indoor gas fireplace. 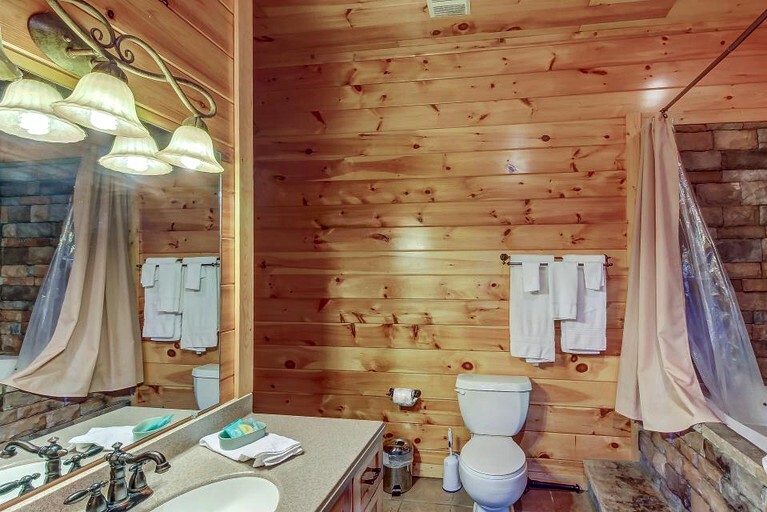 There is a private washer and dryer, so guests can leave the bulky suitcases at home. 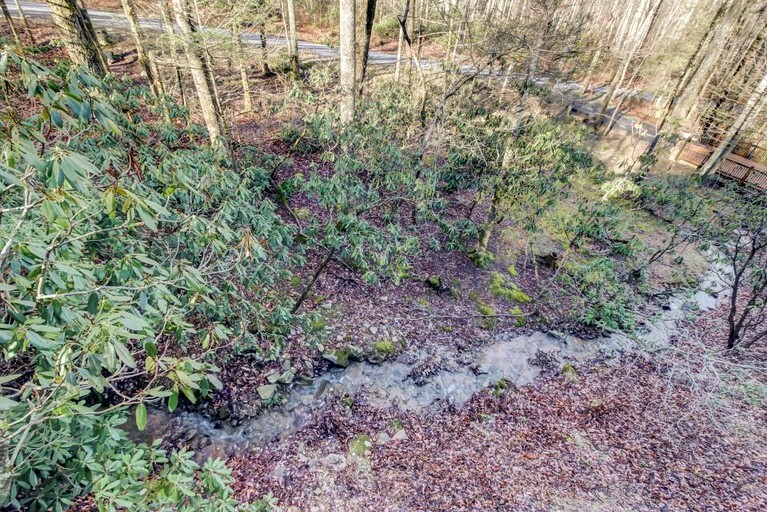 Great Smokey Mountains National Park has some stunning trails for hiking through the woods. 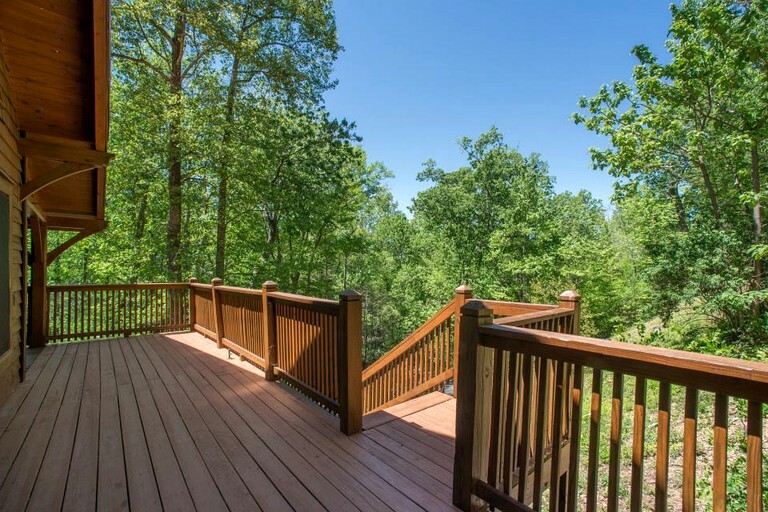 Guests can also check out zip-lining companies in Sevierville to get a great view of the landscape from up in the treetops. 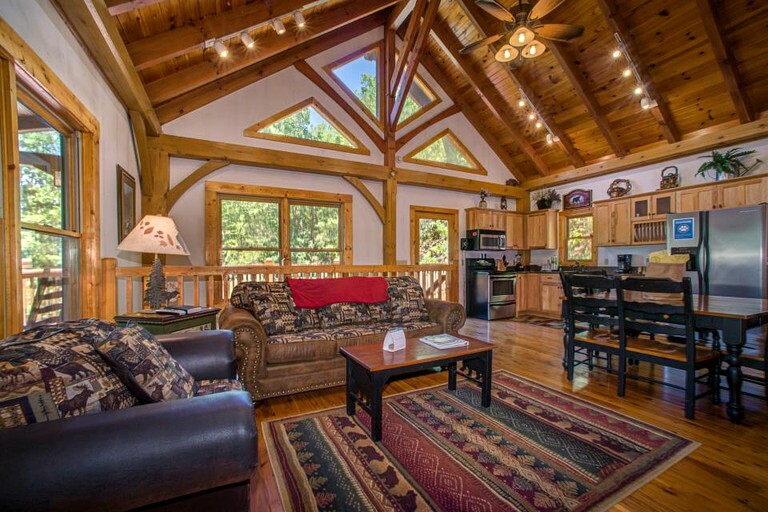 There are nature and wildlife tours available with local guides, providing a great opportunity for photography. 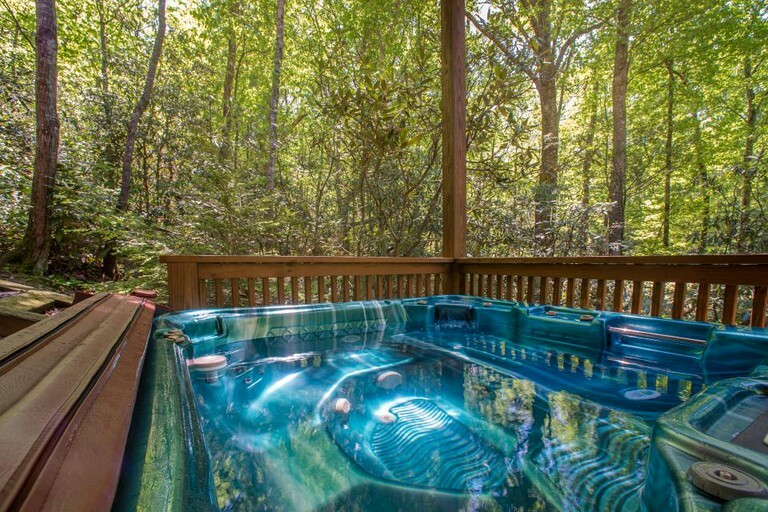 After soaking in the outdoors, guests can hop in the car and visit nearby attractions such as Dollywood in Pigeon Forge, Gatlinburg, and NASCAR SpeedPark.